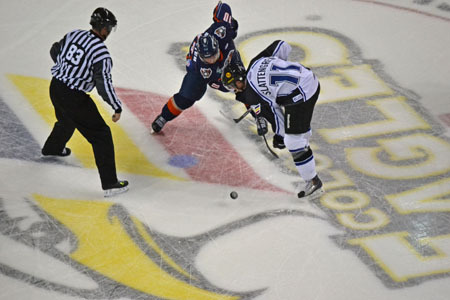 LOVELAND, Colo. – The Ontario Reign defeated the Colorado Eagles, 4-1, in the first of back-to-back games — and the second of three in a row — between the two teams. Ontario scored all four of its goals in the second period, riding the strong 20 minutes of play all the way to the win. Colorado took a 1-0 lead into the first intermission after getting a power-play goal from Riley Nelson at 13:01. Aaron Schneekloth got the primary assist on the play, but did most of the work to make the goal possible. The Eagles defenseman took the puck end-to-end, working it deep into the offensive zone single-handedly. The puck eventually found its way back to him at the right point and his shot was deflected top-shelf by the Eagles’ captain who was standing in the slot after getting dumped to the ice moments earlier. The Reign played a much stronger second period, scoring four goals to take a 4-1 lead into the third period. If it weren’t for Andrew Penner’s strong effort in net, the score could have been much worse because Ontario out-shot the Eagles 20-8 in the frame. The Reign tied the game at 1 with a power-play goal of their own at 3:34 when Steven Tarasuk put the puck past Penner. And five seconds after another Ontario man-advantage ended, Bill Bagron made it 2-1 by tapping home a loose puck in the crease. Geoff Irwin made it 3-1 for the visitors at 16:18 when C.J. Stretch found him wide open between the circles. Ontario capped off their scoring in the second with just 53 seconds left in the period when Bagron picked up his second goal after a turnover in the Eagles’ end led to a 3-on-1 in the low slot. Colorado had an early power play in the third period, providing them a chance to get right back in the game with a goal. However, they couldn’t take advantage, and the rest of the game was spent with the Eagles trying to catch up, which they wouldn’t do, as neither team scored another goal. The teams will meet again Saturday night at the Budweiser Events Center.